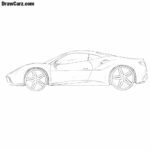 Everyone loves cool sports cars, and the team of drawcarz.com is no exception. 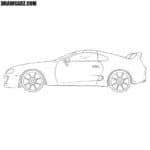 In fact, we love fast sport coupes, and not only love to ride them, but also draw. 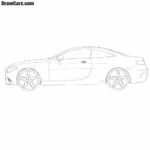 So, here we show how to draw a BMW 6 series. Let’s start with the fact that with the help of very light lines we carry out the body lines of our BMW 6 series. Now we outline the details of the body of the BMW, such as windows, mirrors, headlights and wheels. Go to the details of our BMW. In this step, we will carefully draw the headlight, bumper and hood lines. Now let’s get down to the outline of the roof. It should be done with very smooth lines. Here we will execute windows and mirrors. It is time for the rear of the BMW 6. 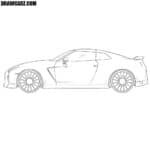 The roof should very smoothly flow into the trunk, as in all coupe cars. Draw the tail lamp and bumper outlines. Now it’s time to draw the door of the BMW. Since this is a coupe, we need to draw one door. We also draw the handle and lines on the body. Now we draw big and cool wheels and outlines of rims. 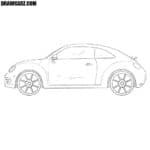 By the way, the article about how to draw a car described in more detail the process of drawing rims. Without shadows, the car will not look complete, so we add some shadows on the body of our BMW 6 Series with hatching. We believe that there is nothing better than being able to draw cool cars. This lesson was about how to draw a BMW 6 series and in future we are going to show you a lot of other cool cars.